Good golly – last week was awesome! We had a busy Saturday Market right up to the minute it started raining, about noon. Lots of Mother’s Day gifts were bought at our market. Thanks everyone for shopping with us! So almost the whole state of Oklahoma got rain last week, a lot of rain. Then the cold front moved in and we are having another cool down this week. I said it was nice when Mother Nature did the watering, but she is working overtime! We headed to Oklahoma City Sunday morning to be with son and it actually turned out to be a beautiful day. Donnie wanted to plant a new pot for his porch area so we went to the store, bought a nice size pot, potting soil and selected appropriate plants. I know what you are thinking, I was working on Mother’s Day, but I love digging in the dirt, and am especially happy doing it with our son! Then he grilled some big, juicy ribeye steaks for dinner with corn on the cob and Caesar salad…yum! So it was back to the lake and the gardens. 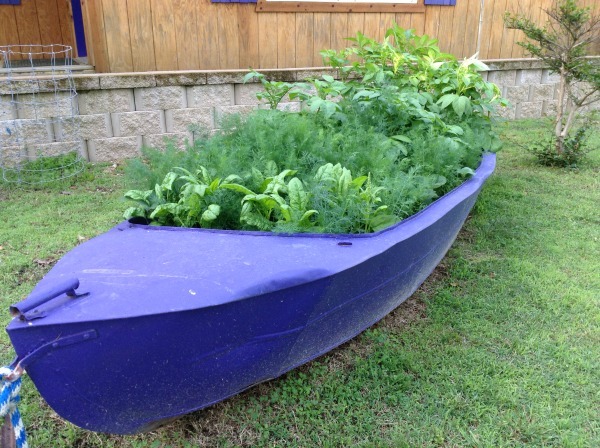 My boat garden is somewhat of a mess because I planted potatoes in it in early spring, then the strawberries made a big comeback, then the spinach I seeded came up, and then an abundance of dill started popping up from dropped seeds from last year. Everyone knows I hate to kill anything that is thriving, so the boat is rather full. BUT, the plethora of dill seems to have protected the strawberries from predators like birds, etc. because we have actually eaten our own strawberries for the first time ever! You have to look under the dill, spinach and potatoes to find them, but they are there and in tact. I may have come up with a new formula of companion planting, where one plant helps the other. So, the Saturday Market at The Artichoke just keeps gaining momentum and we had a lot of vendors and a lot of customers. We will be there again with onions, radishes, spinach, lettuce, turnips, salsa, strawberries, eggs, cookies and pies, pottery, two jewelry designers, and still have plenty of flowers. Come and see us 9 to 1 Saturday!! Dig This – Welcome Back Spring! Dig This – Welcome To Apri!